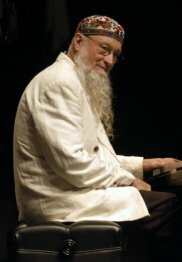 Composer and performer Terry Riley is one of the founders of music’s Minimalist movement. His early works, notably In C (1964), pioneered a form in Western music based on structured interlocking repetitive patterns. The influence of Riley’s hypnotic, multi-layered, polymetric, brightly orchestrated Eastern-flavored improvisations and compositions is heard across the span of contemporary and popular music. Performers who have commissioned and/or played his works include: Kronos Quartet, Rova Saxophone Quartet, ARTE Quartet, Array Music, Zeitgeist, Steven Scott Bowed Piano Ensemble, John Zorn, Sarah Cahill, California E.A.R. Unit, guitarist David Tanenbaum, electric violinist Tracy Silverman, drummer George Marsh, bassist Bill Douglass, the Assad brothers, cello octet Conjunto Ibérico, Crash Ensemble, Abel Steinberg-Winant Trio, pianists Werner Bartschi and Gloria Cheng, Calder Quartet, Arditti Quartet, Amati Quartet, Alter Ego, Sounds Bazaar, Paul Dresher, singer Amelia Cuni, Bang-on-a-Can All Stars, and guitarist Gyan Riley.